A group of people trying to achieve their dreams in a cold, dark city. A group of space explorers are trying to survive in a hostile environment. A gunslinger is looking for the person who killed their family. All these characters have one thing in common, they are tormented by Fae who drive, cajole and interfere with their lives. 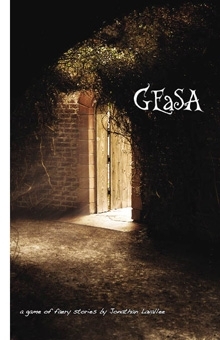 In Geasa you will play people trying to achieve their dreams and the Faeries that get in their way. There is no setting, you will build it as you build your characters and play out a number of scenes. Geasa is a game of unlimited possibilities limited only by your imagination. This title was added to our catalog on December 16, 2010.